Let's put a close eyeball on what upland hunters are facing this season and then take a look at some of HSP's leased farm properties. To simplify, let's look at South Dakota, Nebraska and Kansas, since these three states offer the best potential this season. South Dakota - Hunters in South Dakota will enjoy pheasant numbers that continue to be some of the best in the "states' History." The pheasant "per mile count," was up 3% over last year. Last year HSP had over 1,500 acres leased. This year they added two more farms, with 8 units, and a total of 2,833 acres. With all those available acres, how's a guy know where to go? After all, not all those acres are for upland hunting. There are mule deer, white-tail, turkey, fishing and waterfowl to choose. With HSP it is quite "Simple." Read the harvest reports...or...read the property descriptions. That's right! When new maps are posted, all members receive an updated "revision map list." This consists of new properties, discontinued properties, changes to properties and former properties that are returning to HSP. Let's take a gander at just a few of the property descriptions: - More SD land to walk for birds! The 450 acres in Faulk County is comparable to most. There are few dugouts on the North side of the road that the land owner says you should have great luck with and also the West boundary line on the North side holds a good number of pheasants. The southern portion might be worth walking, but it's not as promising as the North. A few miles west rests 2,383 acres of native grasses which does operate a rotational grazing that will take up a small portion at a time. The main access to the property is from the southeast. To get to the two best hunting areas where all types of game are held with the sorghum planted take the north road beginning at GPS point D3. 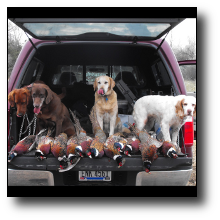 You will find plenty of pheasants in the Best Hunting Area. And how is this for a bonus: "however, the entire property is great waterfowl hunting." There are plenty of slews and ponds all over the property that hold water year around. South Dakota fish, game and park put in three different damns located on the far north part of the property. Here we have a report that says it all... dated 12-8-2009...group of 3 hunters. Saw "50 Pheasant males- got 5." "Saw 100 pheasant females." Now, how awesome is that? How often can you claim to see 50 roosters in two and one-half hours? Severe weather impacted the pheasant and quail numbers in part of the state, especially the core areas of their range. Fortunately the Southeast region offers abundant pheasant numbers. This year HSP has added approximately 5,100 acres on to the existing 2,580 (est.) acres. Here are a few excerpts describing some of the leases - "In the core of Nebraska lies this 2,172 acre farm composed of 4 Units. Unit B and D consist of rolling hills and ditches lined with trees and grassy cover which should make for some interesting hunting. And then, this one - "This farm is located directly north of Washington County, KS and the land owner keeps a heavy eye on it. The farm provides a great mixture of crop, native grasses, and timber. There is also CRP enrolled on a few of the neighboring properties. It took some time to get this lease back, but we have it now! And finally this...This looks to have a couple great bow locations. Unit C is one to get excited about! Thick grasses, CRP, and crop cover this spread with a timbered creek running through center. The 35 acres of CRP ground is located on the south portion and has thick grasses and cedars to the west. This farm is great for ALL types of game! Both Units D & E are excellent holding places for deer, turkey, and has a plentiful habitat for upland game. Personally I have always considered Kansas the "Crown Jewell." HSP has leases in the far west and northeast. The northeast farms are close enough to the Kansas City Metro area so daily hunting trips are possible. Now South Dakota has more pheasants, no argument there. But, Kansas is closer and the upland forecast is very good. Whatever your favorite game might be, HSP is striving to keep the leases to the proper proportions. To that end, from late December 2009, to the present, HSP added 28 properties bringing the total number of leased farms in Kansas to 78! The number of acres exceeds 50,000! In the heart of deer country! This tract which is full of an endless food supply has a thick swampy refuge area filled with timber running through the center of the parcel. The landowner stated that every time he checks his crops he jumps a couple healthy bucks. It looks to be a huge bedding area and holding tank for the thumper bucks! It also holds turkey, quail, pheasant, and ducks mentioned by the farmer. This farm boasts about having 822 acres bordering the Jefferson and Atchison county line filled with stocked ponds to enjoy the property even out of hunting seasons. Unit B- Don't over look this Unit. It has plenty of timber with a creek running through it and crop on the bordering properties. Unit's C, D, and E are a combination of crop, timber, grass, and draws. I won't let the cat out of the bag, but don't be a stranger to one of these units. Unit A is a mixture of crop with grass cover to the North and an island in the middle which seems to be a nest for game. The farmer has stated that he also usually flushes birds out of the crops traveling to an ample food source which doubles for cover. Harvest Report dated 11/15/10 and 11/16/10 - North Central Kansas - one hunter - saw 5 rooster pheasants each day and got up one covey of quail. The weather is changing. The fall season is approaching. Are you getting into the spirit? Getting the bug? Spend a little time on the reservation system. Get an idea of where the upland game birds highest populations are predicted to be. Read fellow members harvest reports and be ready to make that choice when the farms are turned on. It is well worth you time.